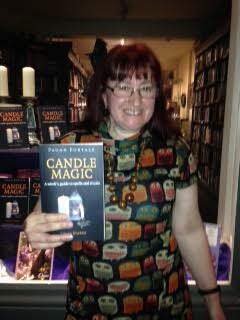 Yesterday I asked people to send me pictures taken at the launch of Pagan Portals - Candle Magic at Treadwell's Bookshop on Friday. This picture was taken by my friend Liz Hayward and shows me standing outside the shop window holding a copy of my book. If you want to buy a copy of Pagan Portals - Candle Magic, Treadwell's has them in stock. Pop along to the shop at 33 Store Street, London WC1E 7BS. I'd still love to see any more photos taken on the night. Email them to me at badwitch1234@gmail.com for me to put them on my blog, post them on my Facebook page https://www.facebook.com/paganportalscandlemagic/ or put them on Twitter with the hashtag #candlemagic.